Dr. Katie Grawe is a Madison native and happy to be practicing in her home town once again. She graduated from the UW School of Veterinary Medicine in 2003. Since that time, she has practiced in Milwaukee, Black Earth, and Madison giving her a wide range of small animal experience. Dr. Grawe feels strongly about taking advantage of the many continuing education opportunities available keeping her up to date on the latest surgical and diagnostic techniques. She uses an integrative approach to her medical practice, focusing on nutrition and supplements in order to prevent and treat disease. 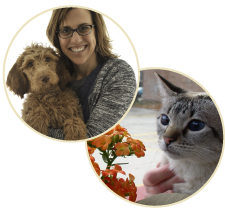 She especially enjoys working with older pets and patients with multiple health conditions, with a goal to optimize quality of life. She will take the time to listen to your concerns and discuss options with you so that you can come up with a plan for care together. Dr. Grawe is a member of the AVMA, WVMA and the American Academy of Veterinary Nutrition. When she's not at Whole Pet, you can find her hiking with her Goldendoodle and 3 kids. She also enjoys reading, yoga, travel, and anything outdoors.